If you are anything at all like me, you are still trying to gather your pumpkins and figure out what your costume will be for the upcoming Halloween festivities. Yeah, I am the master and commander of having my stuff together. 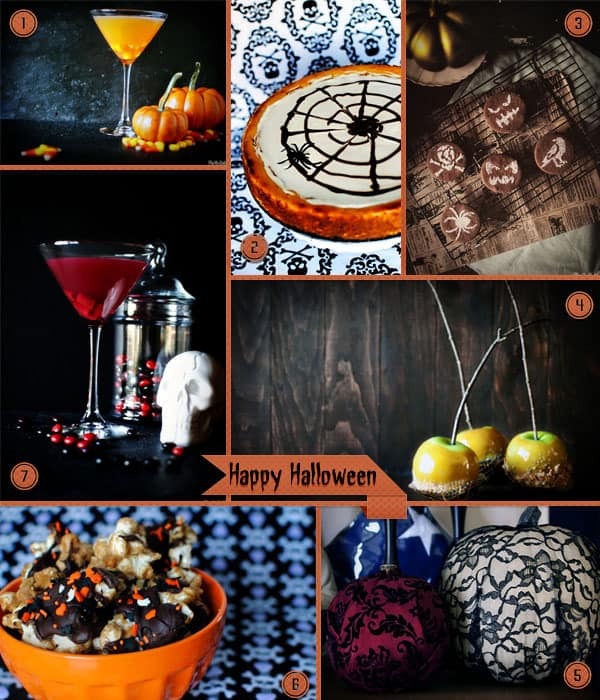 I may not have carved a pumpkin yet, but I can toss you some awesome Halloween themed recipes and posts. Preheat the oven to 350 degrees F. Line a cupcake tin with paper liners. Place the chopped chocolate in a heatproof bowl over a saucepan of barely simmering water. Stir gently until melted and smooth. Remove from heat. Set aside to cool while you prepare the rest of the batter. In a medium bowl, whisk together flour, baking powder, soda, and salt; set aside. In the bowl of your stand mixer fitted with the paddle attachment, cream butter and sugar on medium speed until light and fluffy. Scrape down the sides and reduce the speed to low. Mix in the melted chocolate. Increase the speed to medium and add the eggs, one at a time, until incorporated. Scrape down the sides again. Add the vanilla and beat the mixture until the color has lightened a bit. Add the sour cream and on low speed, mix in half of the flour. Add the water and remaining flour mixture until just combined. Diving the batter among the prepared cupcake tins filling each about 2/3 full. Be sure not to over fill – you don’t want these spilling over the sides (we can say I learned that one from experience). Bake for 20 minutes, rotating pan halfway through, until tops are firm and a toothpick comes out clean. Cool on a wire rack in pan for 10 minutes before turning out to cool completely. 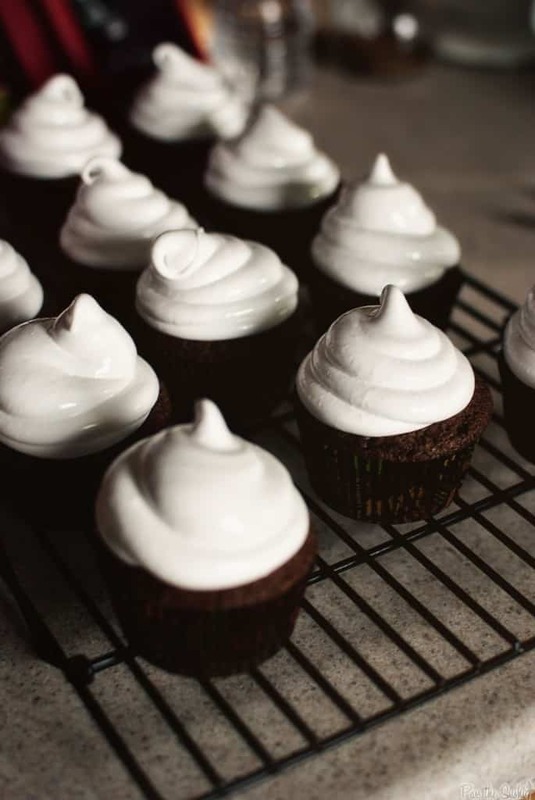 Make the frosting: In a large heatproof bowl, combine the sugar, water, egg whites, and cream of tartar. Using a hand mixer, beat on high speed until foamy, about 1 minute. Set bowl over a saucepan of barely simmering water. Beat with the hand mixer on high speed until frosting forms stiff peaks, about 12 minutes. (Frosting should be 160 on a candy thermometer.) Remove from heat and mix in vanilla and almond extract. Beat for 2 more minutes until frosting has thickened. Transfer frosting to a large pastry bag fitted with a 1/2″ plain round tip. 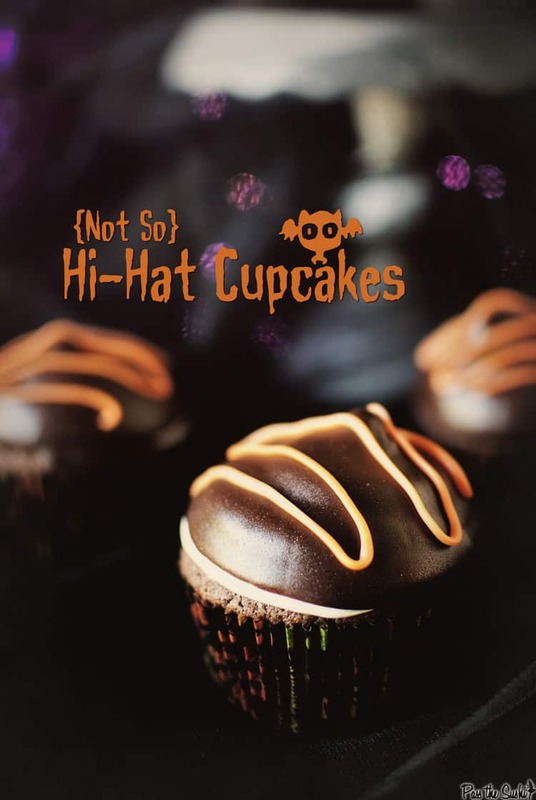 Leaving a slender border on each cupcake, pipe a tall spiral of frosting, 2″ high on each cupcake. Place in fridge while preparing the chocolate. For the chocolate coating; Combine the chopped chocolate and oil in a medium heat proof bowl set over a saucepan of barely simmering water; stir until melted and smooth. Transfer to a wide mug of deep bowl (think about dipping room). Cool for 15 minutes. 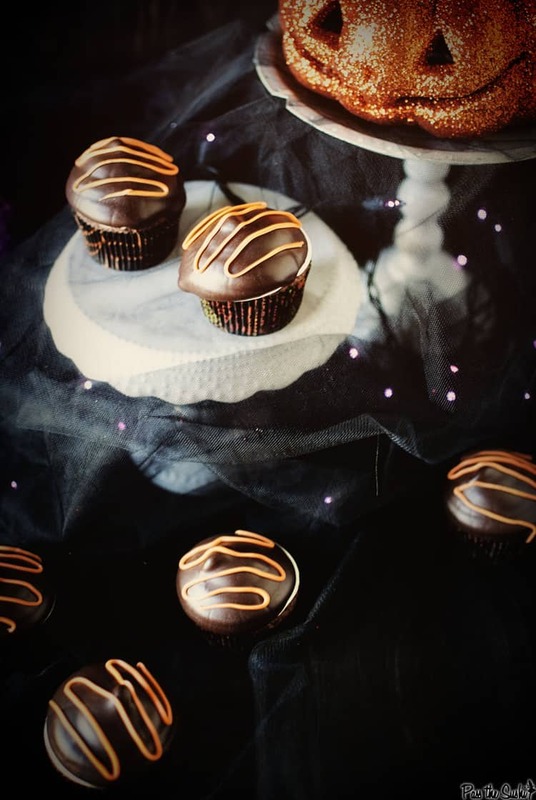 Grab a cupcake from the fridge by the bottom and drop the cupcake into the chocolate to coat it. Allow any excess to drip back into the cup. Repeat for all of the cupcakes. Let cupcakes set for 10 minutes. Refrigerate for 2 hours before serving. Serve cold. Hi-Hats are supposed to be just that, HIGH. But, I was already dead set on this recipe before I realized I don’t own a hand mixer, and there was no was I was whisking those stiff peaks into life by hand. I whisked over heat for a while then transferred the mixture to my stand mixer with the whisk attachment. This did not result in the lasting volume that the cupcakes require and where I may have been tempted to whip out my hair spray to get these bad boys to stand up straight, they tasted too damn good to care! These cupcakes will be revisited properly and re-posted for ya! So pretty! And I would eat these bad boys up! 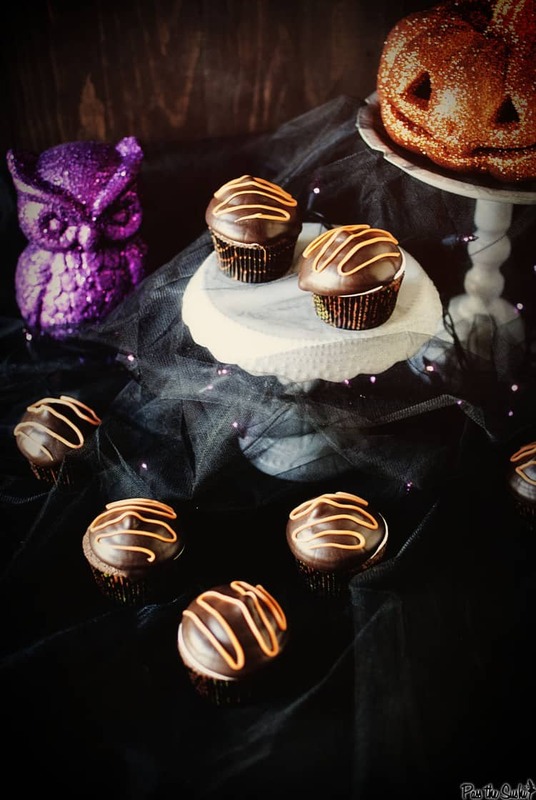 Gorgeous cupcakes – totally perfect for Halloween! These are just too cute and so festive! And yes, I am totally unprepared for Halloween and it’s coming up in less than a week! 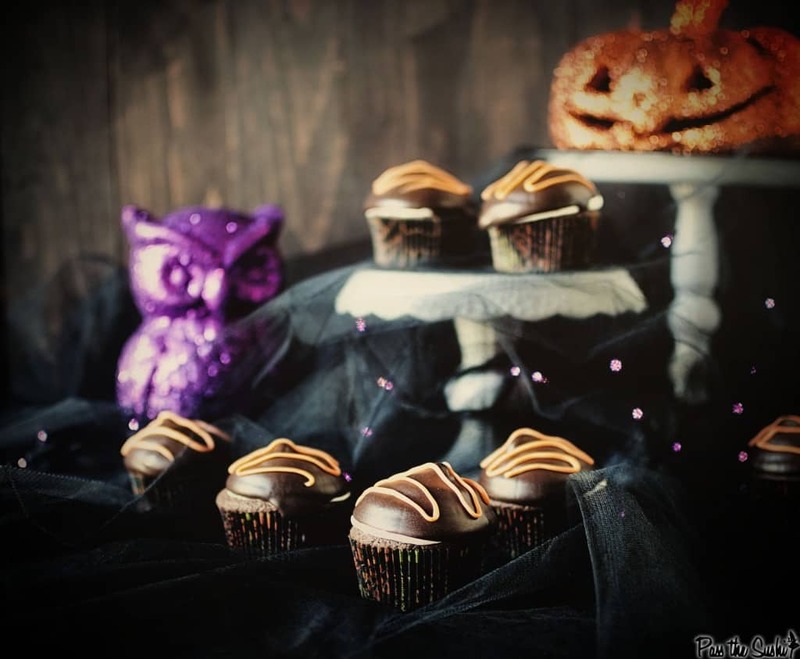 Is it weird if I want to be this cupcake for Halloween? Here’s my concern: I think you’ve been spending all of your time creating amazing food in the kitchen and then taking disgustingly gorgeous photos of that food for this blog. And while this is all lovely, you haven’t been focusing on my pumpkin carving competition. Obviously, this makes me question your priorities. So… get carving.